From 2000 to 2005 I worked in the New Media department of the BBC. 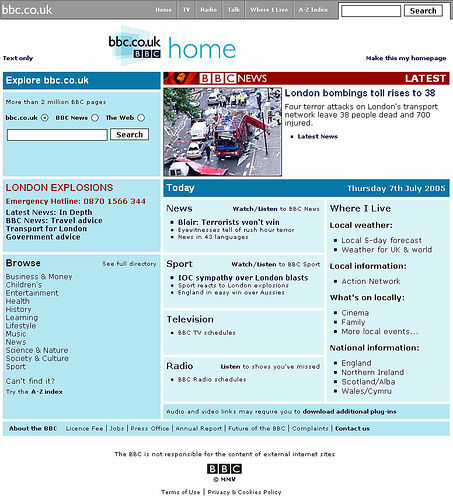 When I started the currybetdotnet blog in 2002 it was natural to blog about my work at the corporation, and the first thing I posted that gained any widespread attention was “A day in the life of BBCi Search”, a presentation based on an in-depth search analysis of one day's search activity across bbc.co.uk. 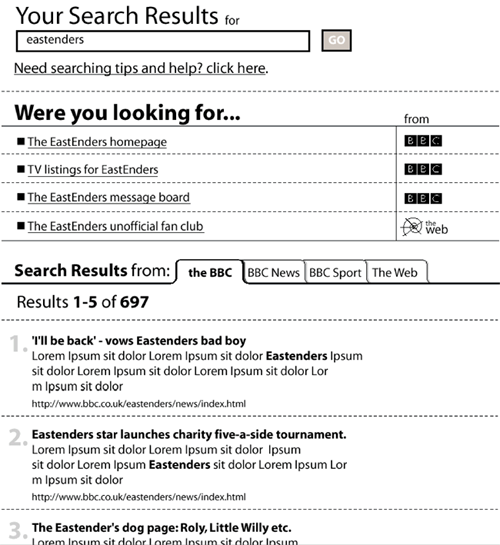 Other articles about the BBC’s search service included "How search can help you understand your audience" from 2003, a review of the 2006 search redesign, and a 2009 series looking at the initial design, launch, and ultimate failure of the BBC’s web search service. 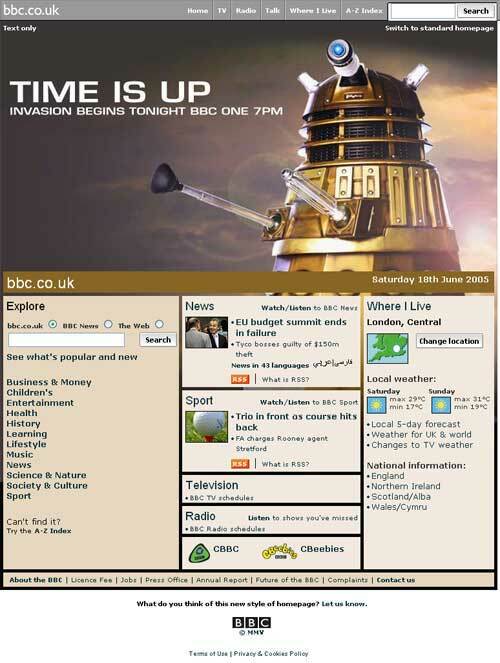 For the best part of 2 years I was technical producer on the BBC.co.uk homepage, launching the first international version and presiding over coverage of events like Ashes celebrations, Children In Need variations, the international appeal for aid following the 2004 Asian tsunami, and London winning the Olympics. I was also there when London faced suicide bombings and a consequent huge surge in web traffic. As well as search and the homepage, during my time at the BBC I looked after email subscription services and online voting - overseeing the vote to name the new bridge at Wembley, Five Live's Sporting Century and the Today programme's Greatest Painting in Britain amongst others. I narrowly failed to launch a BBCi Toolbar for Internet Explorer. Some of the most popular posts on this blog have been about the number of Linux users that the BBC homepage had, once mistakenly quoted as 600 by Ashley Highfield, and the launch of the iPlayer. You can also find posts about the tiresome DRM debate surrounding the iPlayer, and the oldest surviving sections of bbc.co.uk. At the BBC I got the opportunity to go to lots of events, and I wrote about some of them here. “People Don't Like Basements But Tapes Do” is the story of a tour I took around the BBC’s archive at Windmill Road, and I also went to a fantastic Q&A session with Richard Baker and Charles Wheeler to celebrate 50 years of BBC News on television. A couple of these events had a strong focus on Doctor Who, including Julie Gardner talking about “The Tardis and Multiplatform” - Doctor Who’s multi-media incarnations and a 2004 talk on The Making of Doctor Who Webcasts. I’ve also written about Doctor Who and the Vanishing Plaques in Television Centre, and Putting a F__k Off Dalek on the BBC Homepage. You can also read a series of guest blog posts I wrote for the BBC Internet blog at the end of 2007, as part of the celebrations of ten years of the BBC website. The full set can be downloaded in print format as a single PDF document.